Yes, this is a thing! 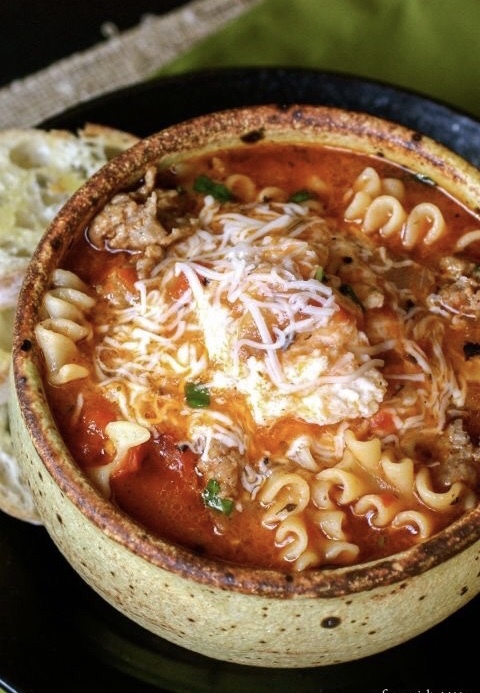 This Lasagna Soup is AH-mazing. The flavors are perfection and I can't wait for you to try this one. DELICIOUS and easy! Heat olive oil in a large pot over medium heat. Add meat, breaking up into bite sized pieces, and brown for about 5 minutes. Add onions and cook until softened, about 6 minutes. Add garlic, oregano, and red pepper flakes. Cook for 1 minute. Add tomato paste and stir well to incorporate. Cook for 3 to 4 minutes, or until the tomato paste turns a rusty brown color.